Posted on March 20, 2015 at 3:29 pm. We’ve seen a recent burst in new online pokie games over the last couple of months, and the interactivity, innovation and graphics just keep getting better. Gaming software developer like BetSoft, Net Entertainment, Play’n Go, Thunderkick and Microgaming have all released some fresh real money slot games, including titles like Spell of Odin, Lucky Leprechaun, Pimped, Golden Princess, Steam Tower, Barber Shop, Magicious and Esqueleto Explosivo. Each game has a unique theme, interactive gameplay and video sequences, and takes the online gaming experience to new and enjoyable heights. We’ve picked two of our favourites from the list of new titles above, and have gone in to a bit more detail about their bonuses, gameplay styles and features. Steam Tower, by Net Entertainment – Inspired by the 19th century’s Victorian era and industrial design, this interactive video slot tales players on a compelling journey, as the main character climbs his way up the steam tower in an attempt to rescue the princess from a dragon. As you make your way up the tower during the free spins mode, you gain multipliers along the way, and if you reach the top floor, you receieve a bonus and a 7x multiplier on all winning spins. A 5-reel, 3-row and 15-payline online pokie game, it features stacked wilds and the minimum and maximum wagers are $0.15 and $150.00. 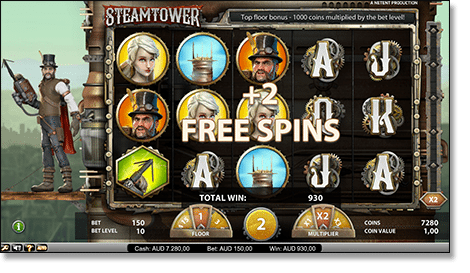 Play Steam Tower at G’day Casino and win real Australian currency. 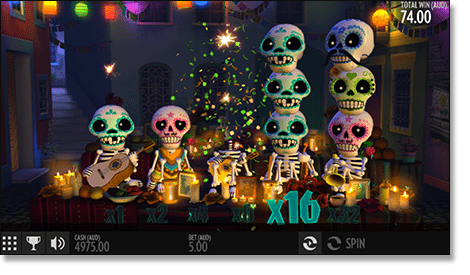 Esqueleto Explosivo, by Thunderkick – A 5-reel, 3-row and 17-payline online pokie game, this title is based on Enrico Mortis and his band called “The Boners” who celebrate the Day of the Dead, a Mexican holiday which focuses on remembering friends and family members who have passed, and guiding their spiritual journeys. Unlike your typical reel slot game, this title uses ‘falling skulls’ as icons, which blow up when they form winning combinations, disappearing and allowing new skulls to automatically drop in their place and form new winning combinations, without the player having to pay for another spin. This will continue to occur, and your multiplier will continue to increase (up to 32x), so long as the skulls which fall create winning lines. The gold skull icon acts as the wild and automatically explodes up to eight surrounding symbols which will be replaced by additional falling skulls, with the multiplier again increasing to its next level. The ‘falling’ icons concept is similar to that of Net Entertainment’s Gonzo’s Quest and Aztec Treasures, and the graphics within the game are sharp and innovative. You can bet a minimum of $0.10 per spin and up to a maximum wager of $100.00 per spin. Play Esqueleto Explosivo at G’day Casino for AUD real money. With great new titles just released, and more on the horizon from newer software developers such as Thunderkick, the online slots gaming experience for Australian players continues to improve in quality and become more entertaining.